There’s nothing better than 5pm on a Monday, except of course 5pm on a Tuesday, Wednesday, Thursday, and Friday. See what I’m getting at here? Work is exhausting and nothing takes the edge off more than heading out to the bar after work with colleagues and friends. Making it extra special? The half-price food and booze that’s so popular all over the world (or at least at the bars and pubs I frequent). It’s Happy Hour, and that means you can eat and drink twice as much as you normally could during regular business hours (responsibly of course). Well Silver Oak wanted to get in on the action, so we created a Happy Hour of our own. And it’s something that you’ll definitely want to raise a glass and say cheers to. Here’s how Silver Oak’s Happy Hour works. 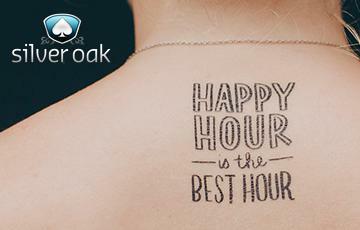 First, claim your bonus by entering coupon code HAPPYHOUR when you make your next deposit. You can do that any time of day to earn the bonus. There’s no time period requirement for this bonus. But here’s where it gets interesting, if you claim the bonus between 10pm and 12pm EST, give us a shout. We’ll add an extra 50% to that bonus. That means you’ll earn a 200% match bonus instead. So, for example, depositing $100 gets you $150 automatically when you enter the HAPPYHOUR code. Contacting us to let us know that you deposited between 10pm and 12pm gets you another $50 on top. Now there are a few caveats here to pay attention to, though nothing major. Because we like to spell out the terms and conditions in plain English for everyone to understand, we’re reiterating them here. The bonus is subject to Silver Oak’s standard terms and conditions. The bonus comes with a 30x playthrough requirement for most games, and a 60x playthrough requirement for blackjack and video poker. Oh, one last thing. You need to deposit at least $100 to earn the bonus, so a $99 deposit or anything less than that won’t work with the coupon code. If you can’t deposit during those hours, the coupon code is still good. Or, check out our promotions page to the other bonus codes that you might like.